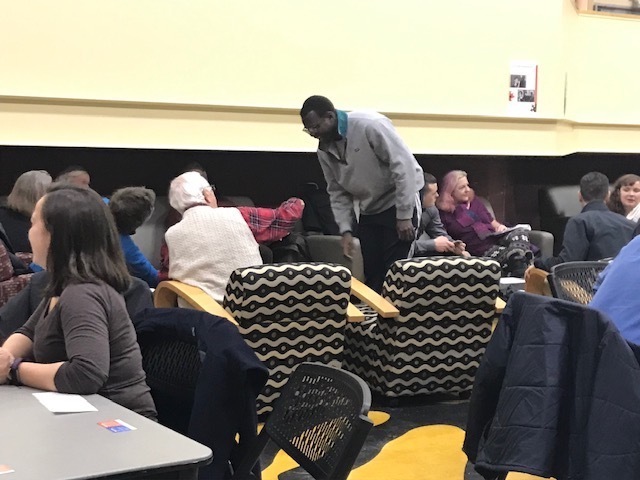 In the company of civilizing influences such as live music, coffee, and treats, Bowdoin students, faculty, and community members gathered last week in Smith Union for the latest What Matters and Make Shift Coffee House conversation. When more than half of the American population reports that the current political climate is a leading source of stress, the attendees at the event were there to chat about the source of that stress for many—President Trump. What Matters is a Bowdoin series that brings people together to talk about a current event. Make Shift Coffee House is a local organization that organizes forums for town hall-like discussions around divisive social and political issues. They collaborated on this program. Make Shift Coffee House founder Craig Freshley started off the event by announcing that the evening was not intended to convert anyone or win over a stranger to one’s side. “We are here to understand people’s views—not to find common ground, change minds, or convince people,” he said. He encouraged people with a wide variety of perspectives to articulate their opinions.